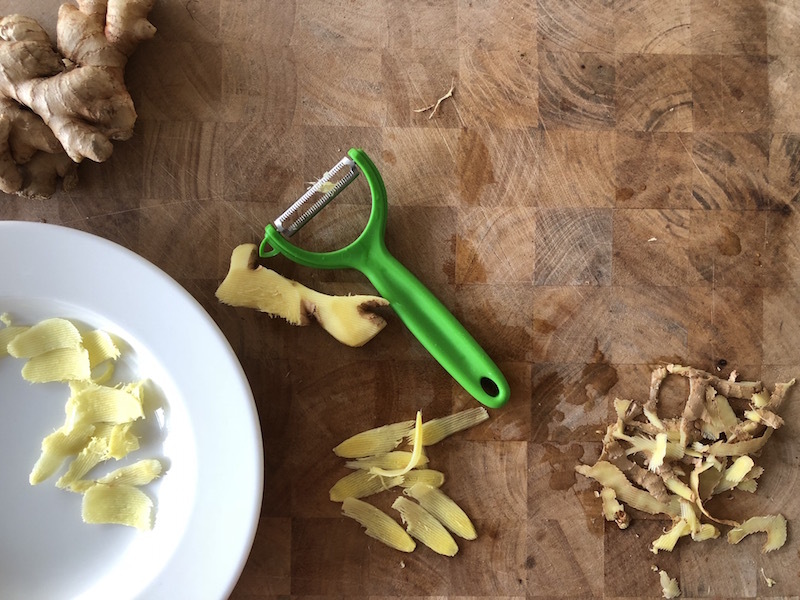 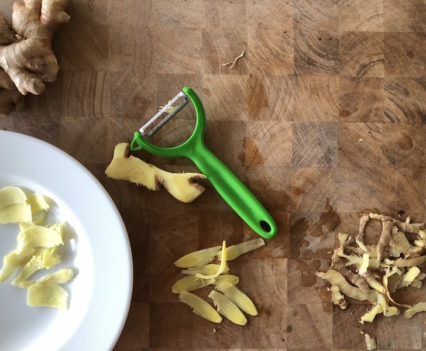 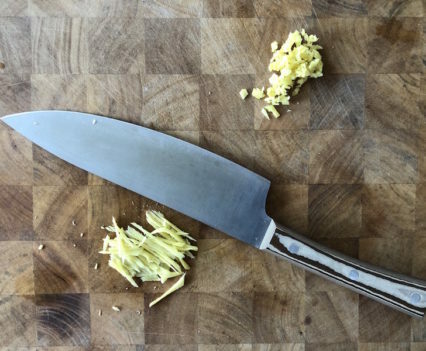 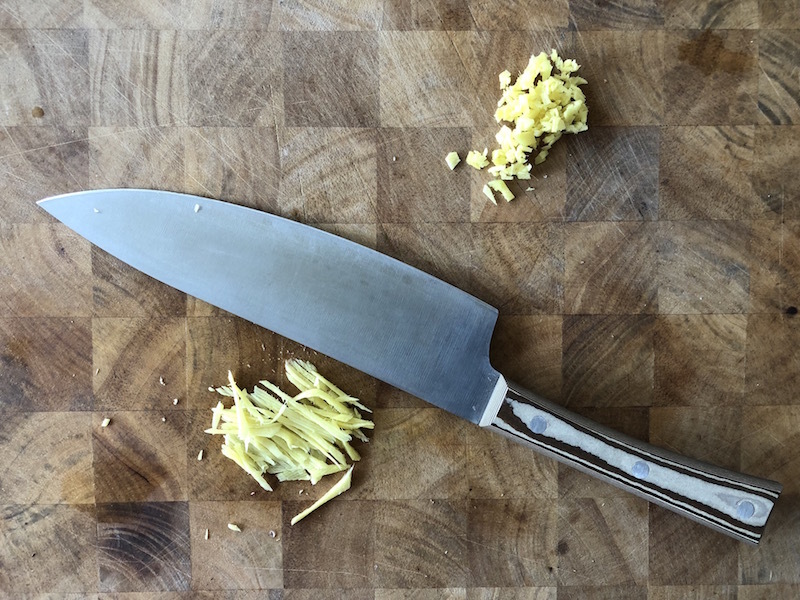 Prepare the ginger sauce: peel the ginger and slice it finely. 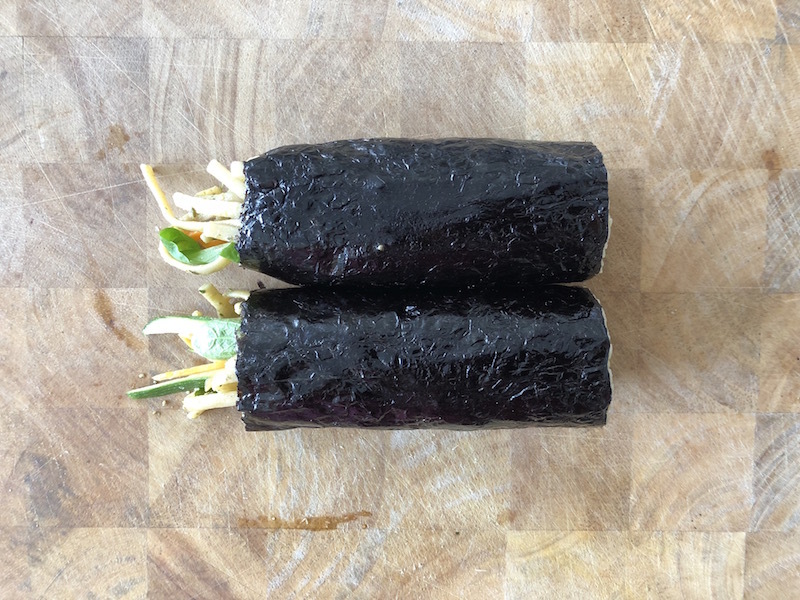 Lay it on a plate and sprinkle with salt: let it rest for thirty minutes; rinse and squeeze it. 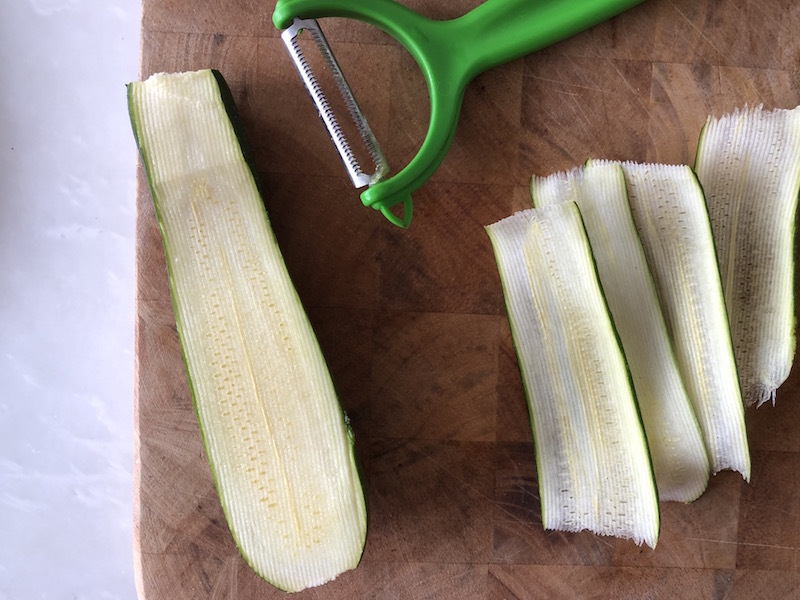 Cut it into very thin cubes. 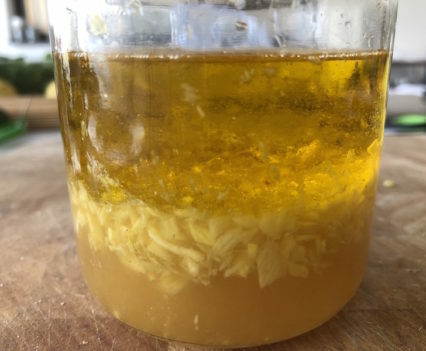 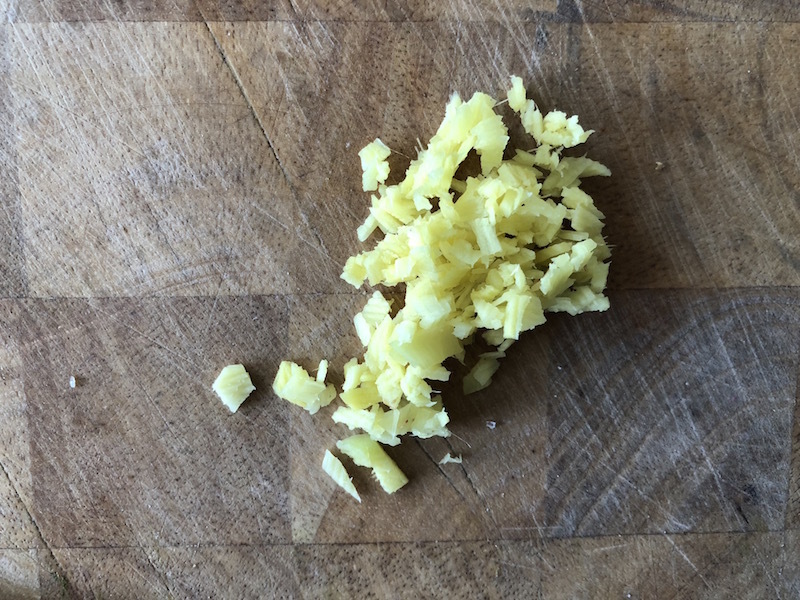 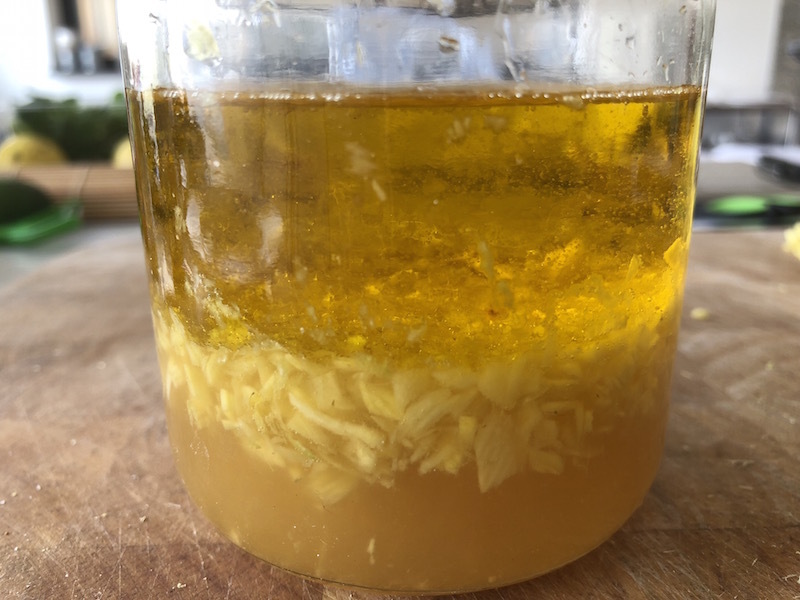 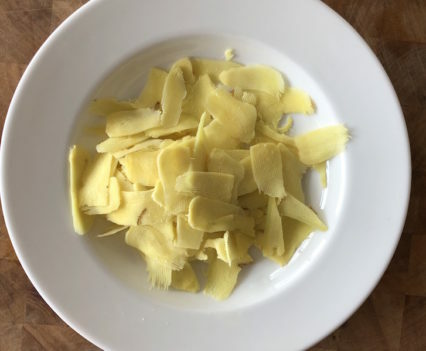 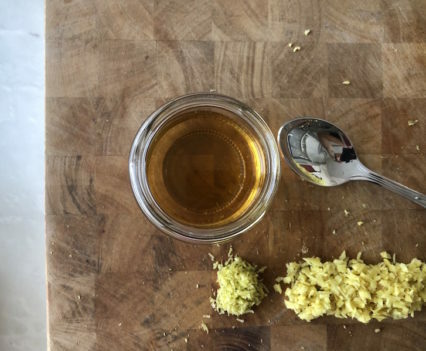 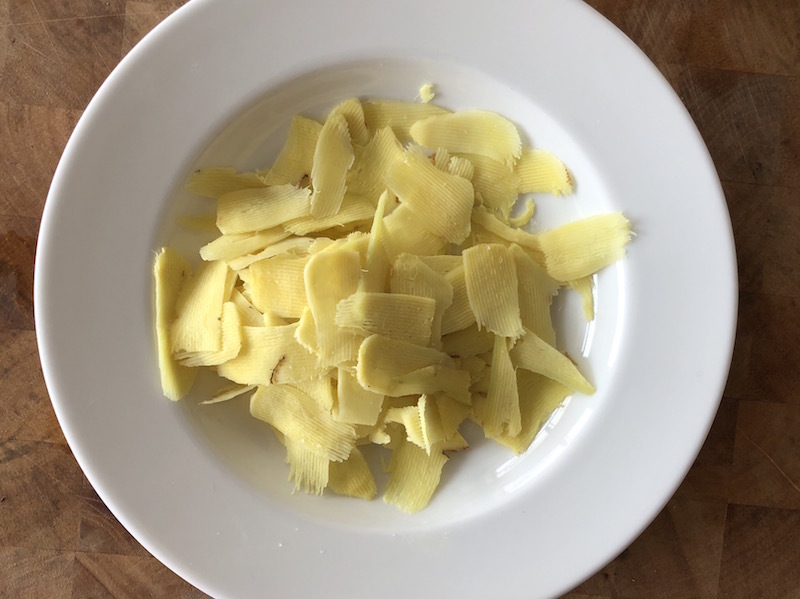 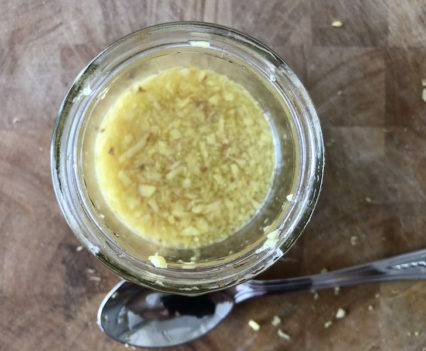 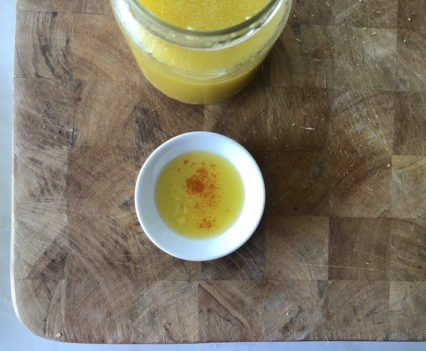 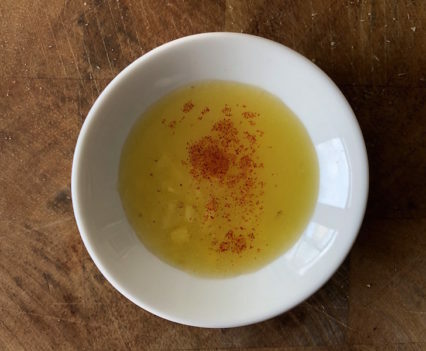 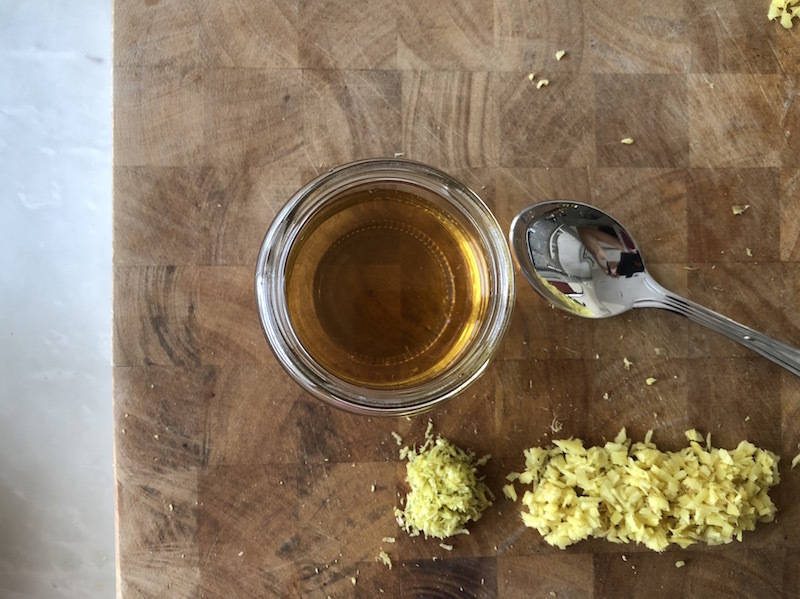 Put the apple vinegar, the agave syrup, the salt, the lemon zest and the ginger (about 1 tablespoon of lemon peel and three of ginger) in a jar. 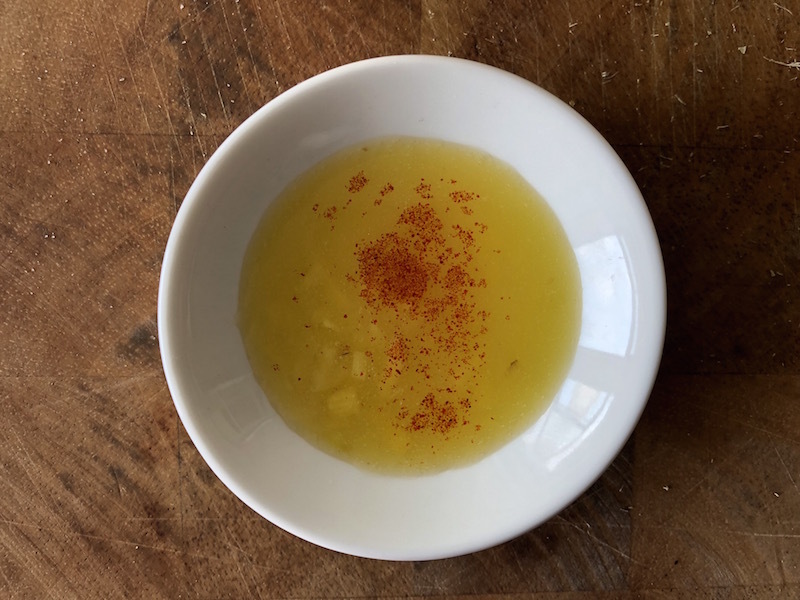 Add the same amount of oil and create an emulsion; add some sweet paprika. 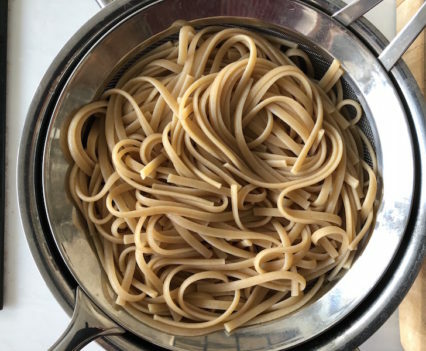 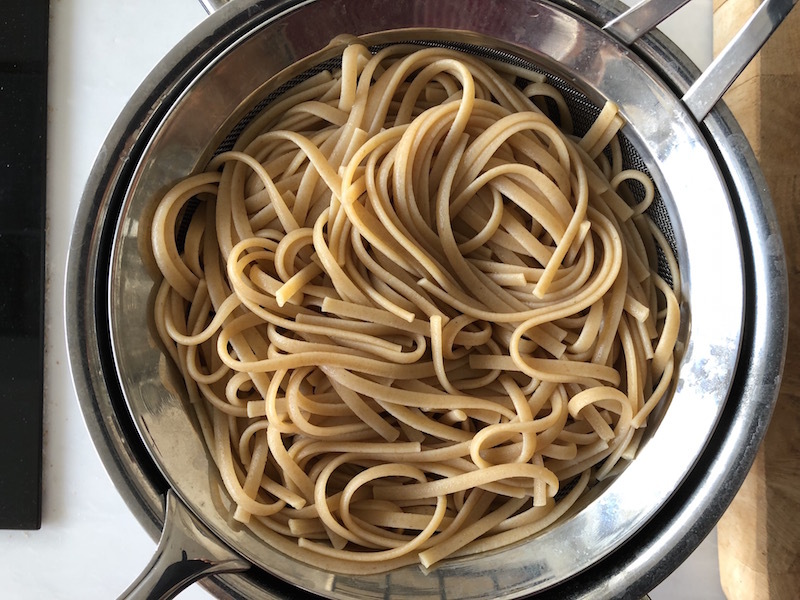 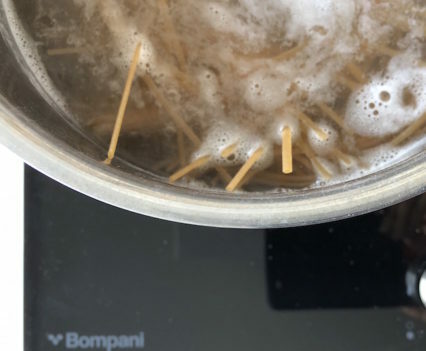 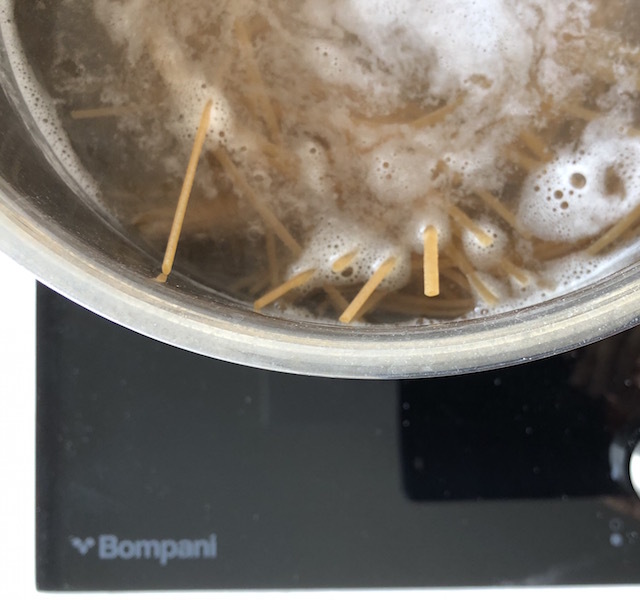 Bring the water to a boil; salt and cook linguine “al dente”. 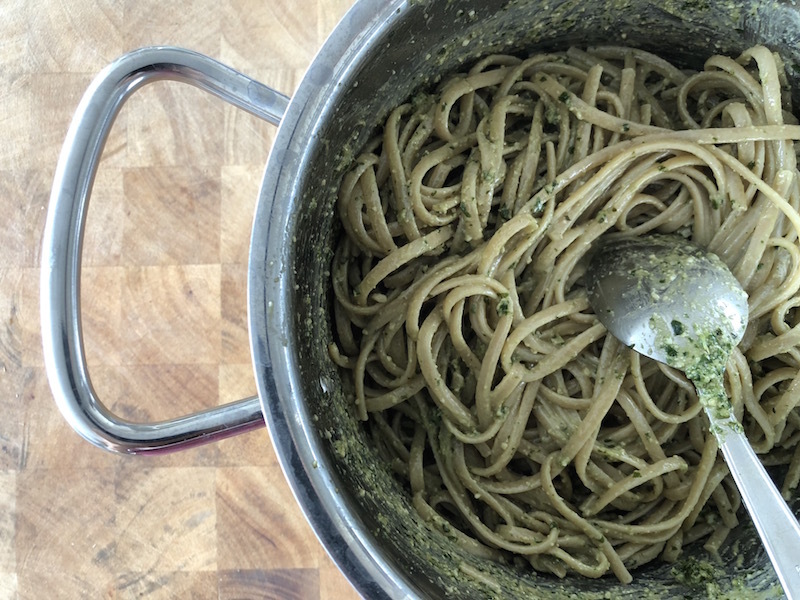 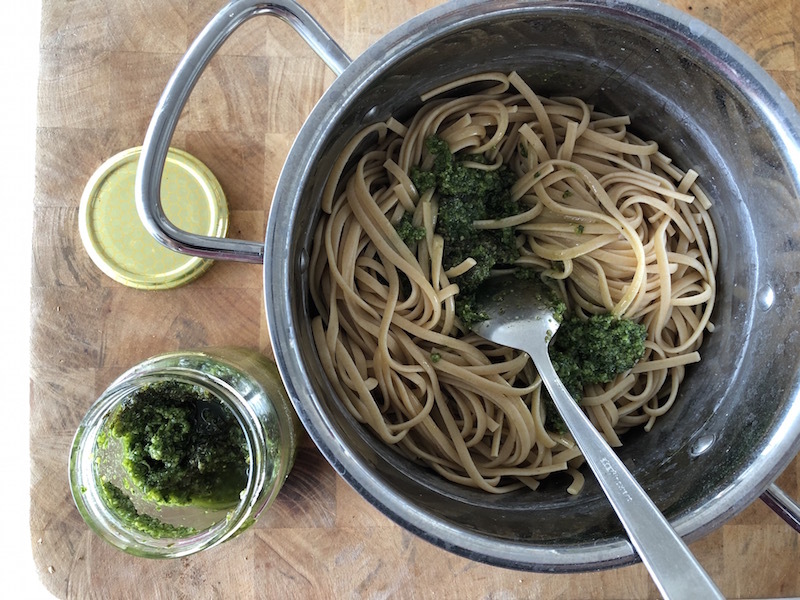 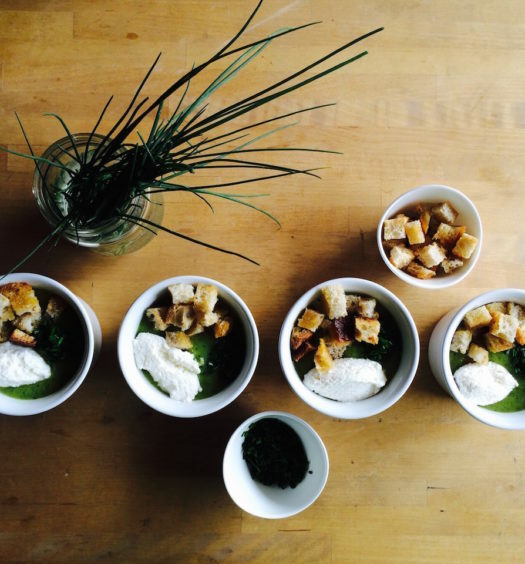 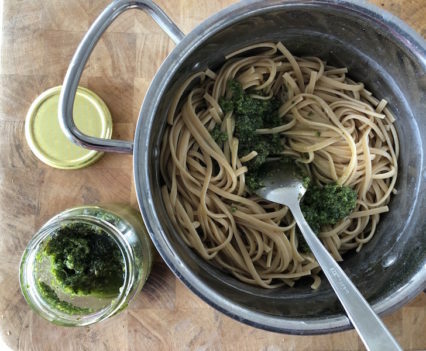 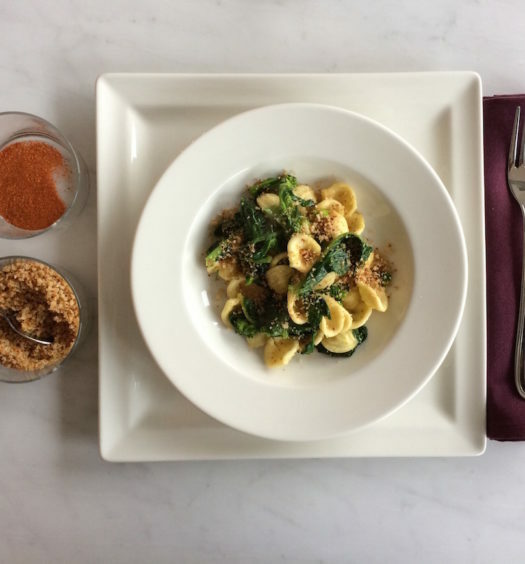 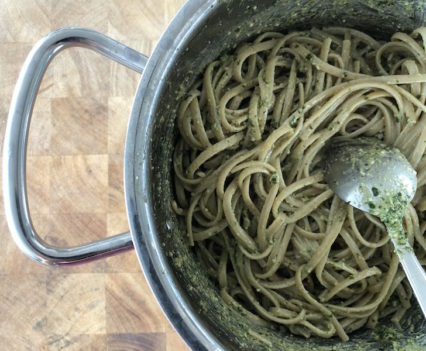 Drain and season with two tablespoons of pesto and one tablespoon of extra virgin olive oil. 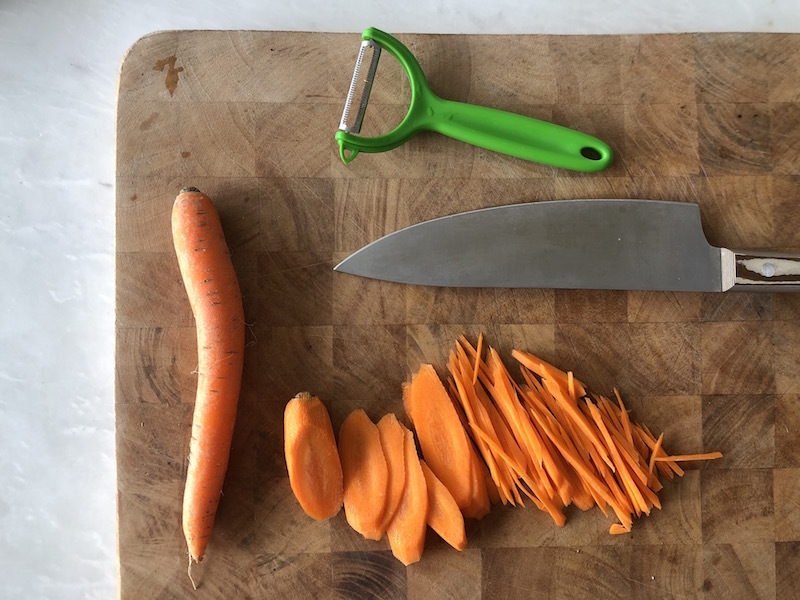 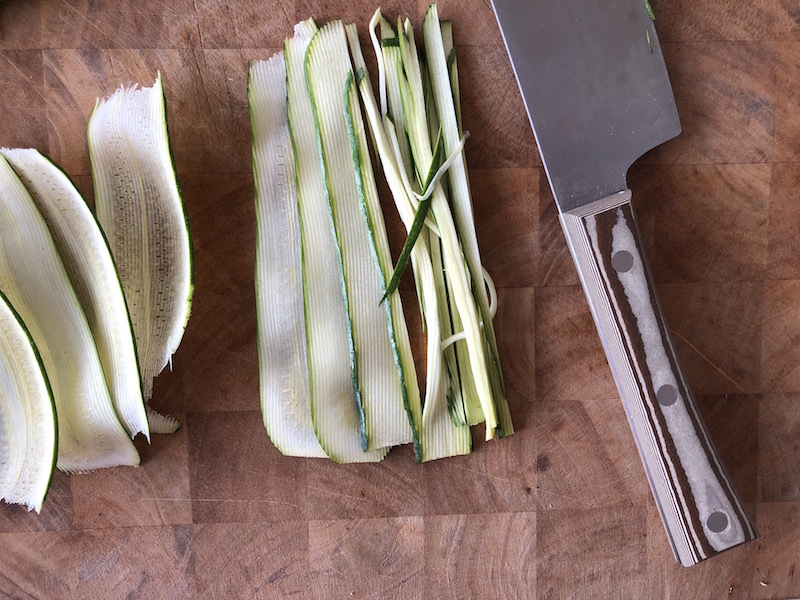 Cut zucchini and carrots “julienne” and season them with oil and salt. 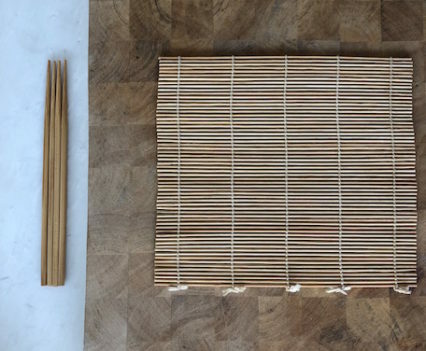 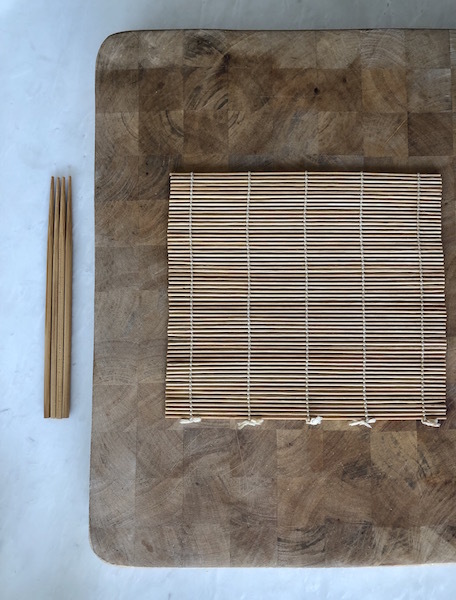 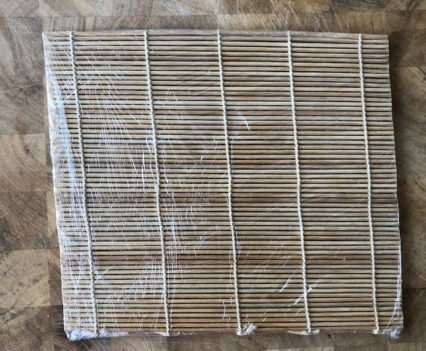 Lay a piece of plastic wrap over the bamboo mat to keep it cleaned. 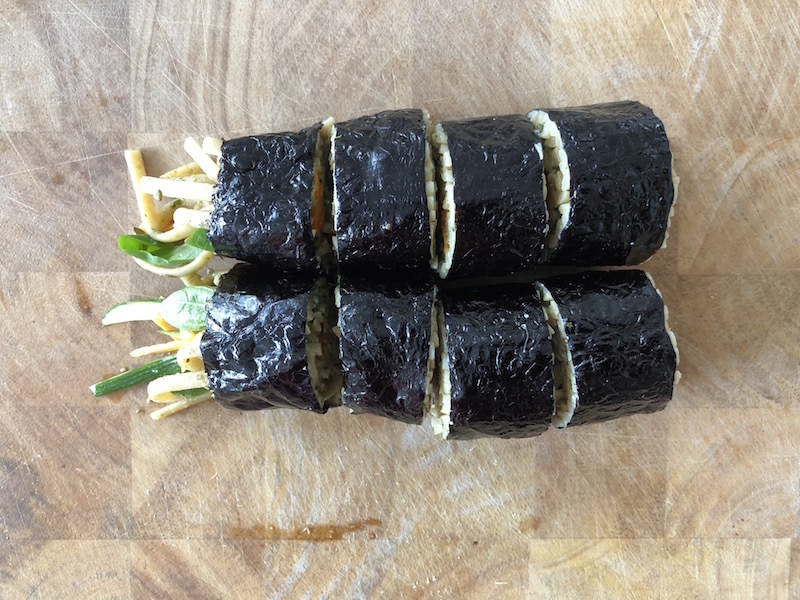 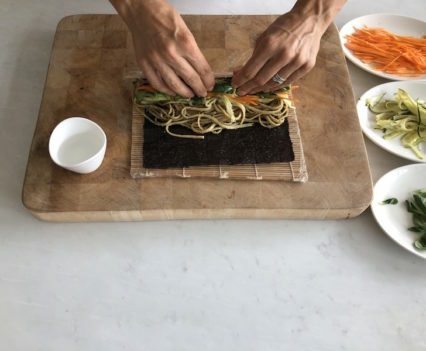 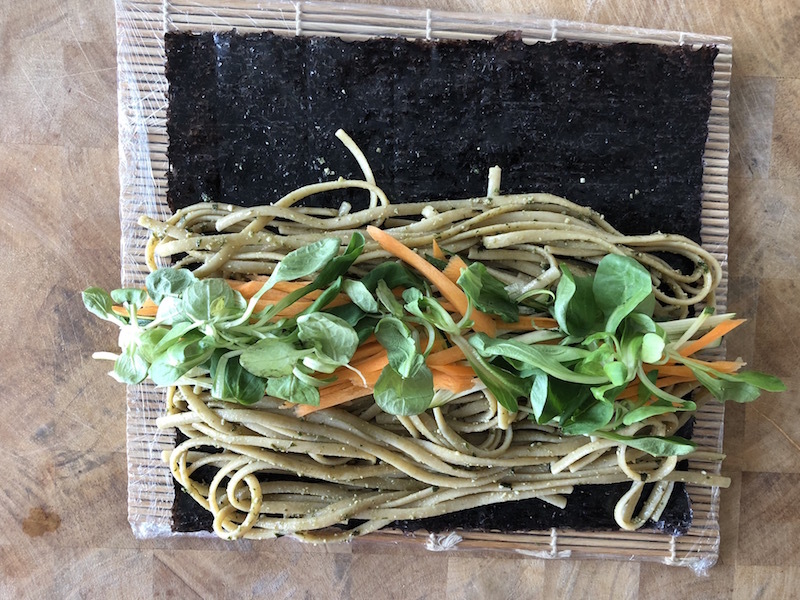 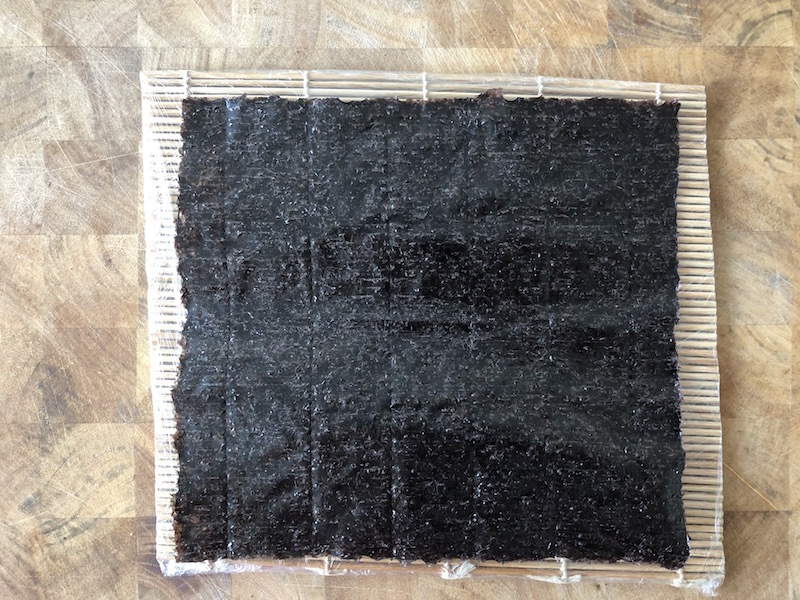 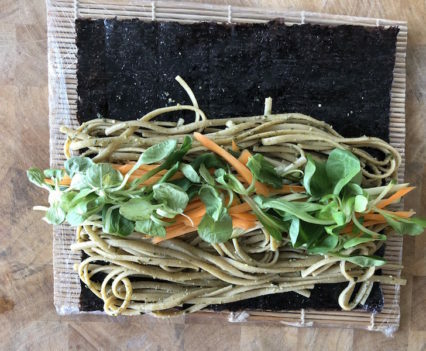 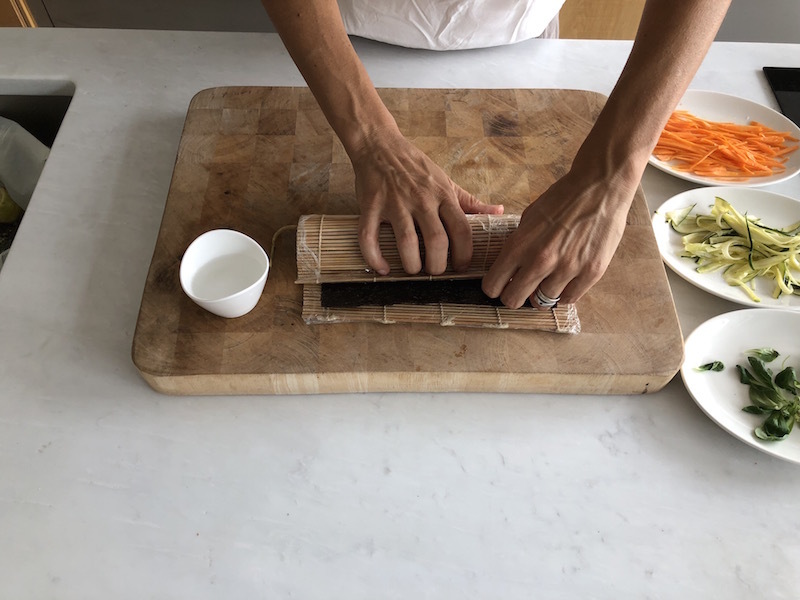 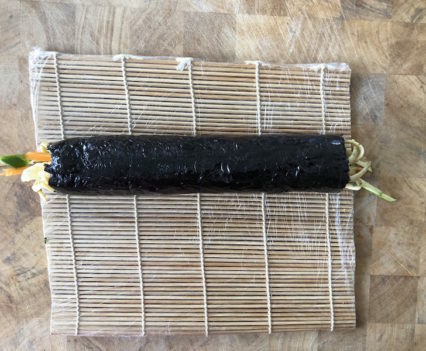 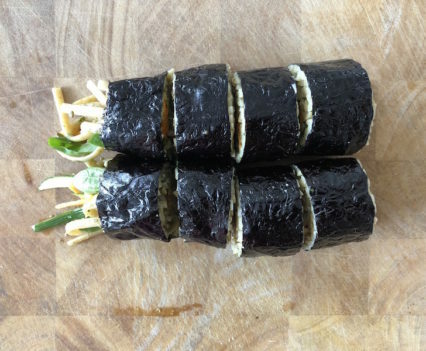 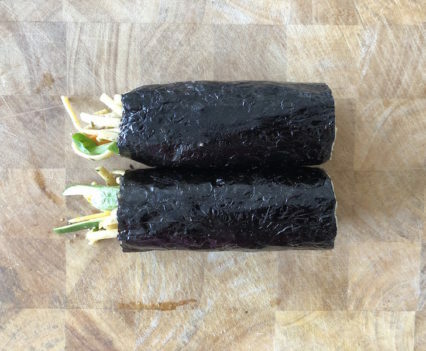 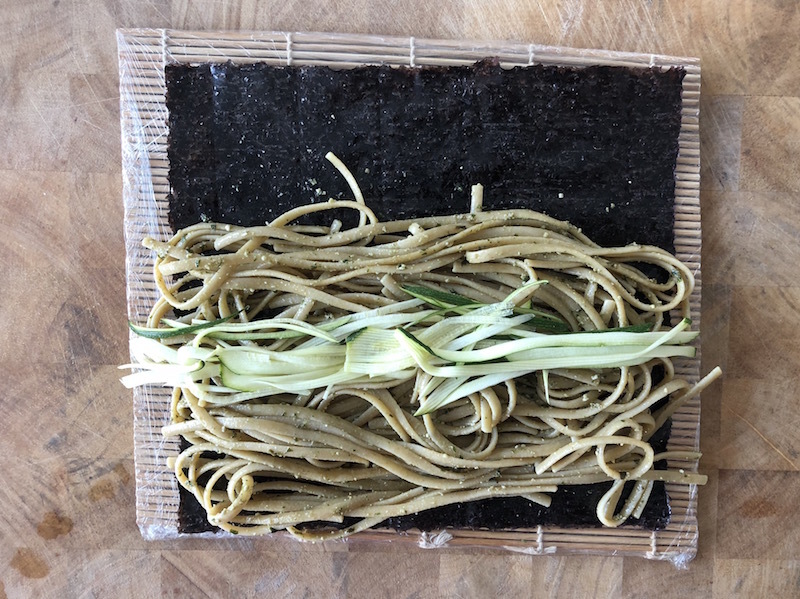 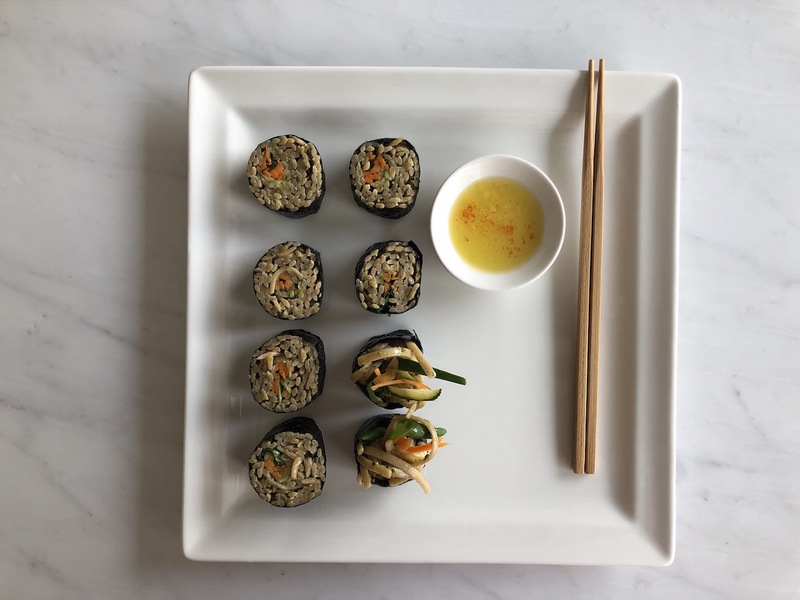 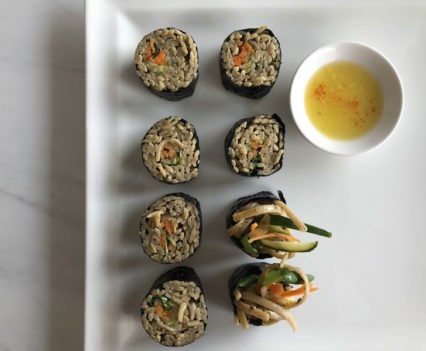 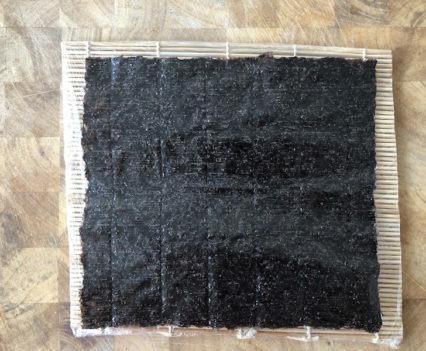 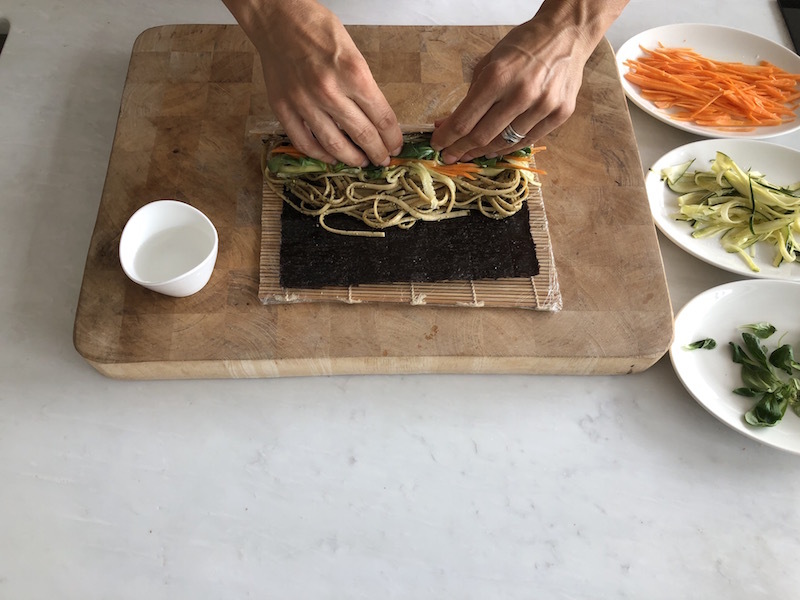 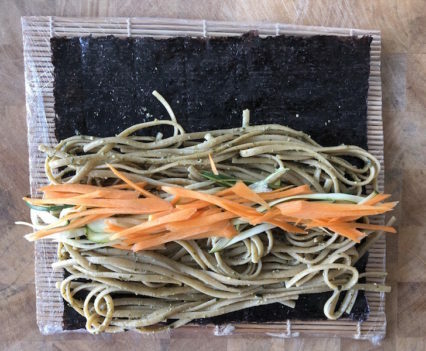 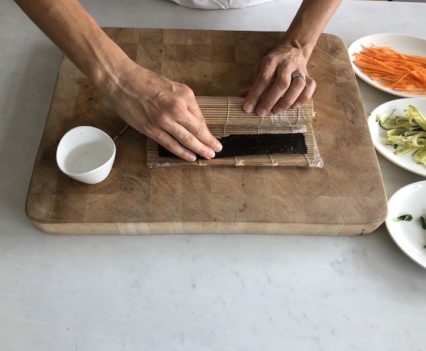 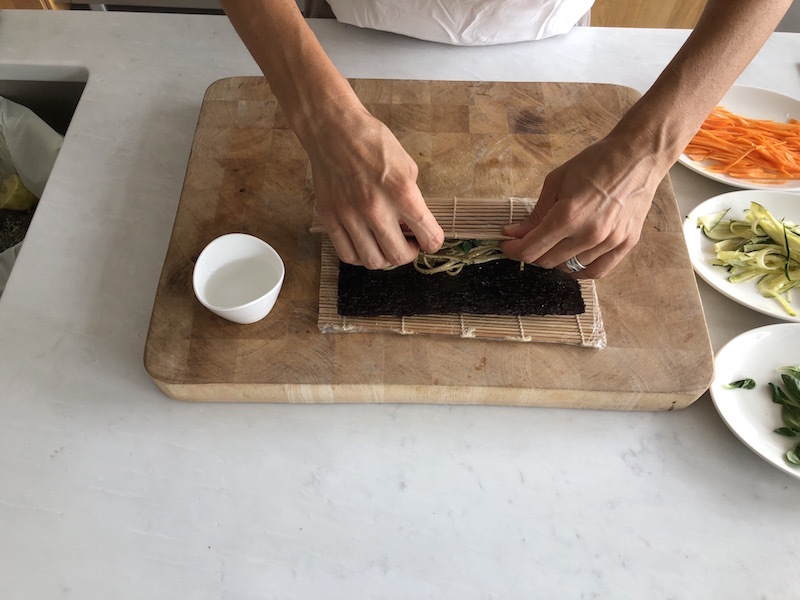 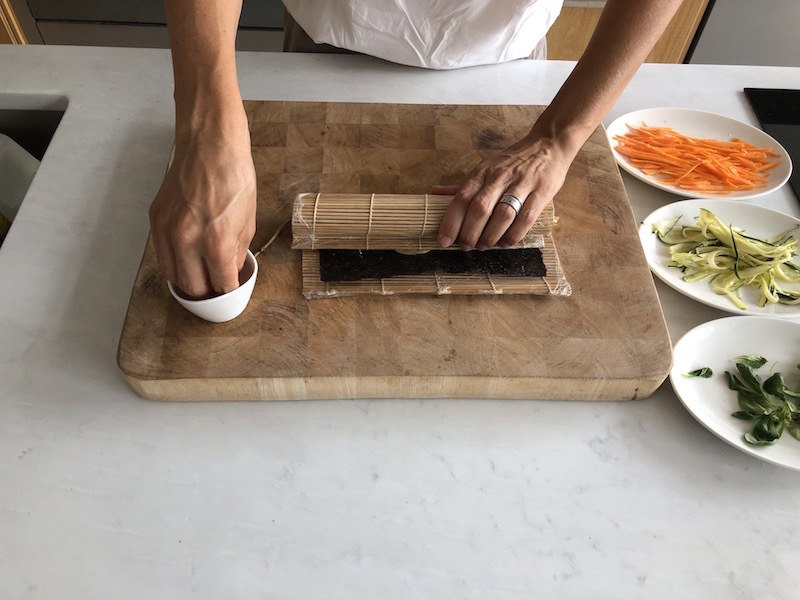 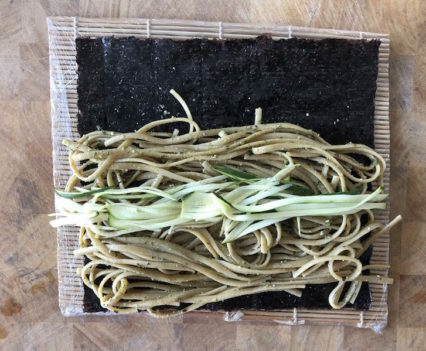 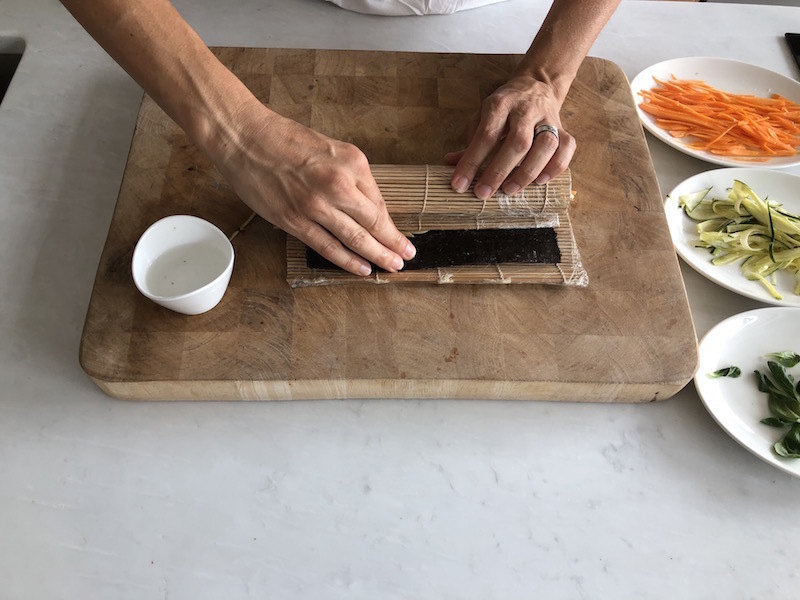 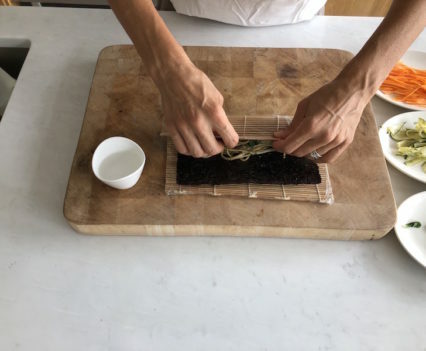 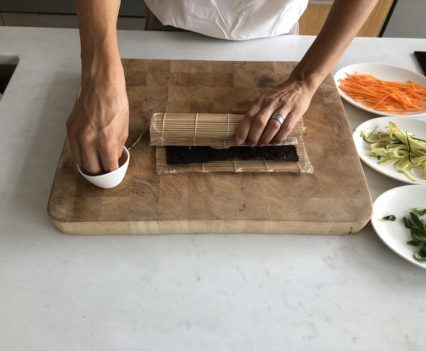 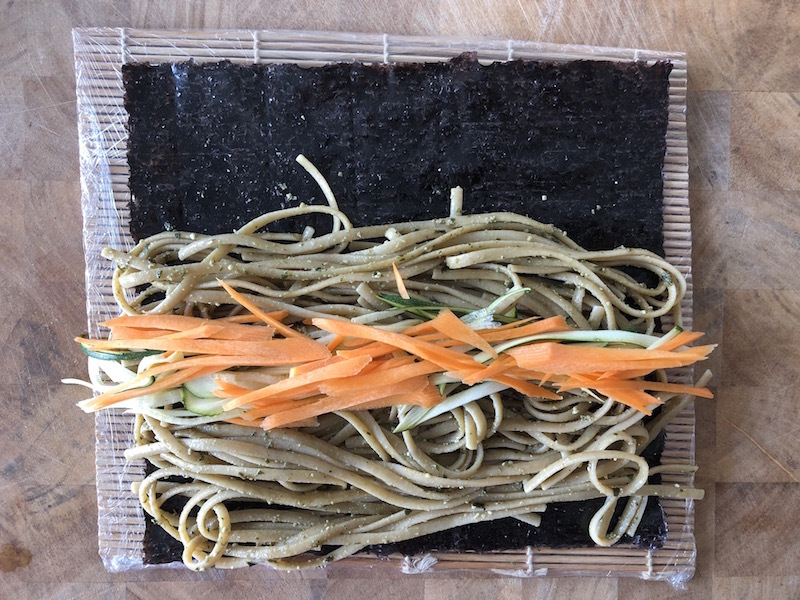 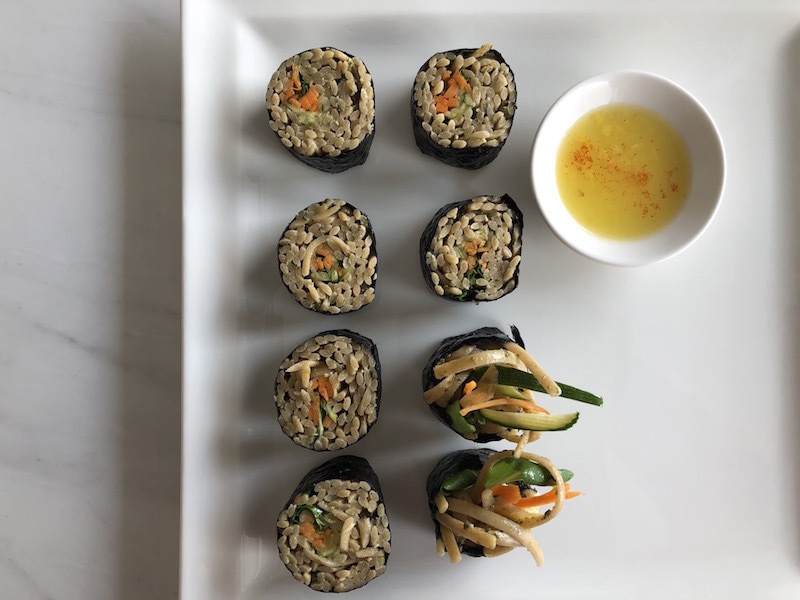 Place a sheet of nori over the plastic wrap on the bamboo mat; spread evenly ¼ portion of linguine on top of the sushi mat, leaving about 1 inch strip along the top of nori farthest away from you: you don’t put the linguine till the end because after you roll, the pasta could come out from the seam; proceed then with zucchini, carrots and valerian. 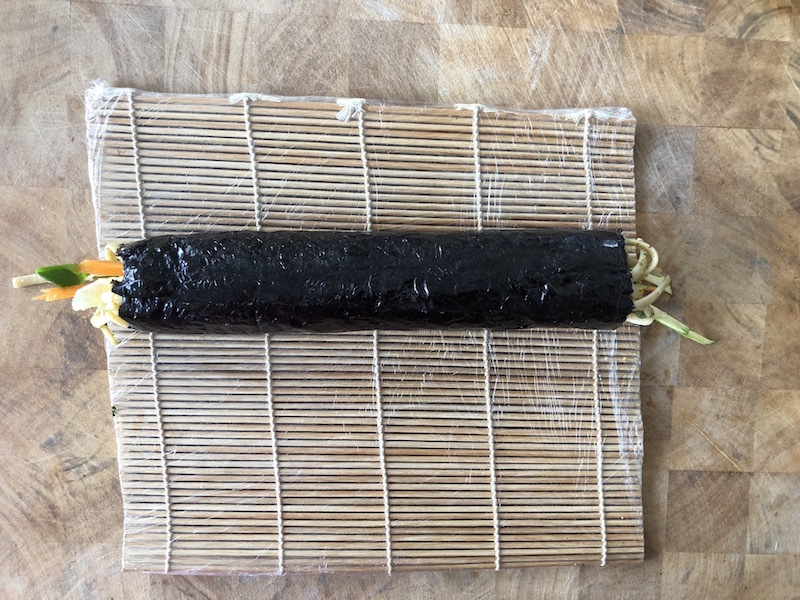 From the bottom end start rolling nori sheet over the filling tightly and firmly with bamboo matt until the bottom end reaches the end of linguine sushi on top; use fingers to hold the ingredients when roll; close the roll reminding you to wet the free part of the nori so that it can stick well; continue to make the rest of the rolls. 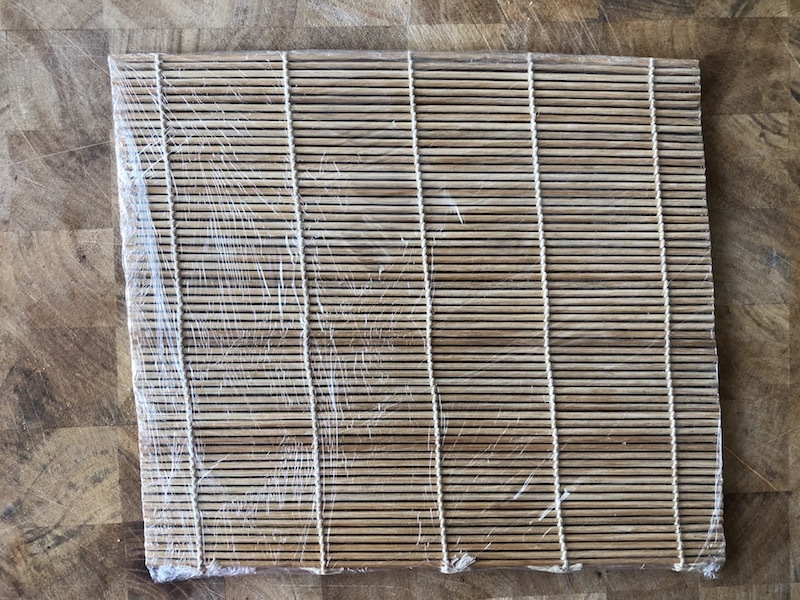 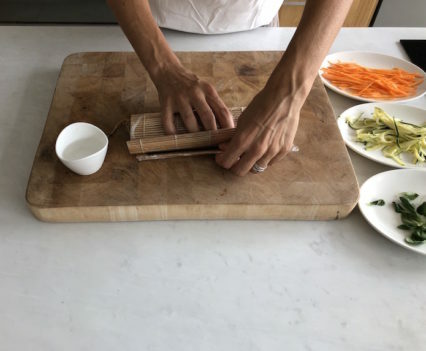 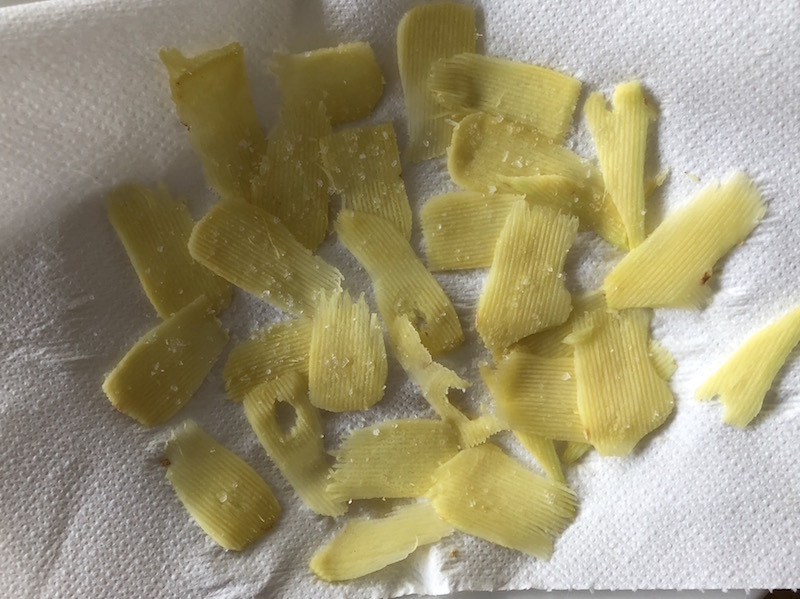 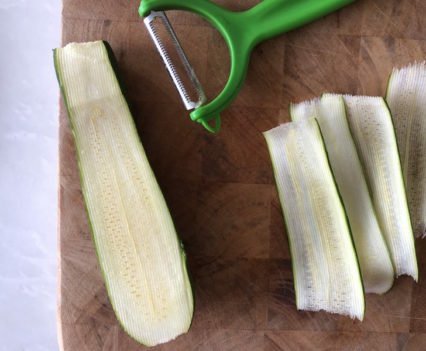 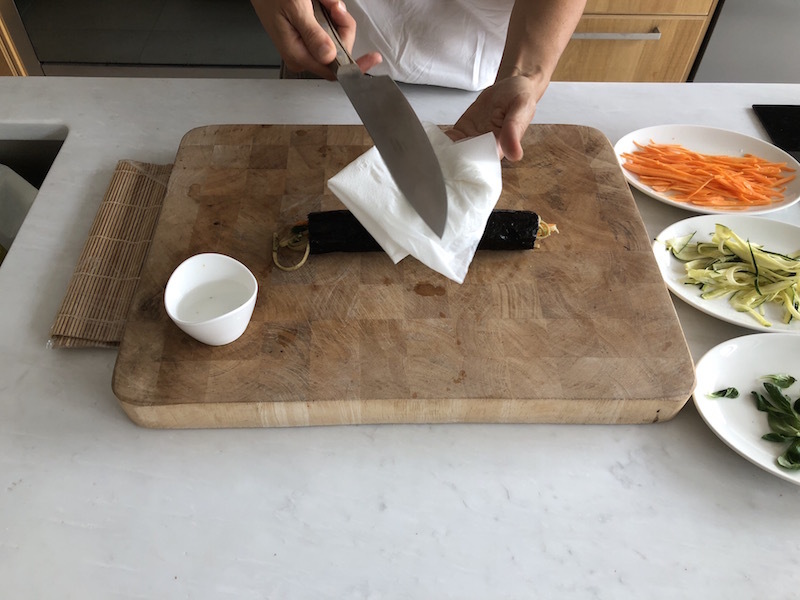 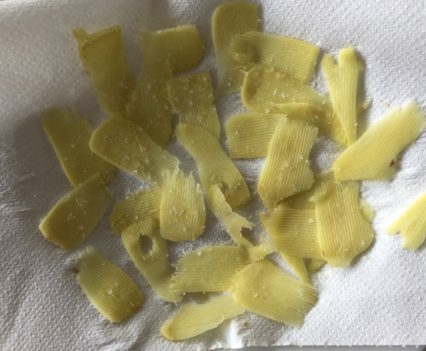 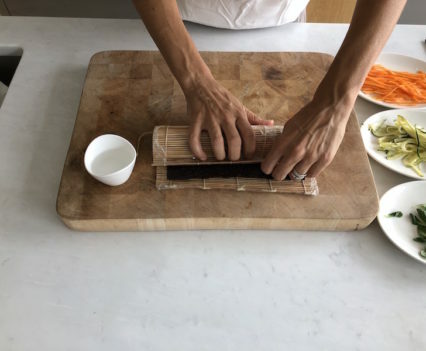 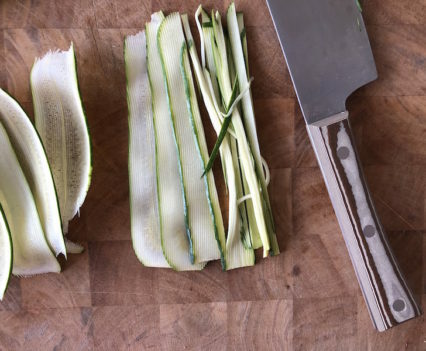 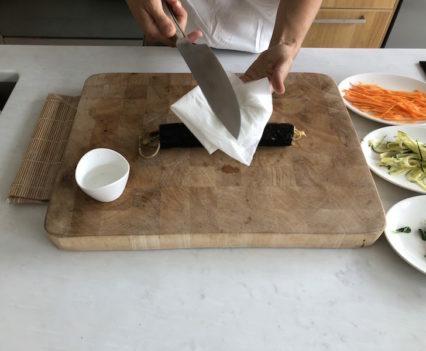 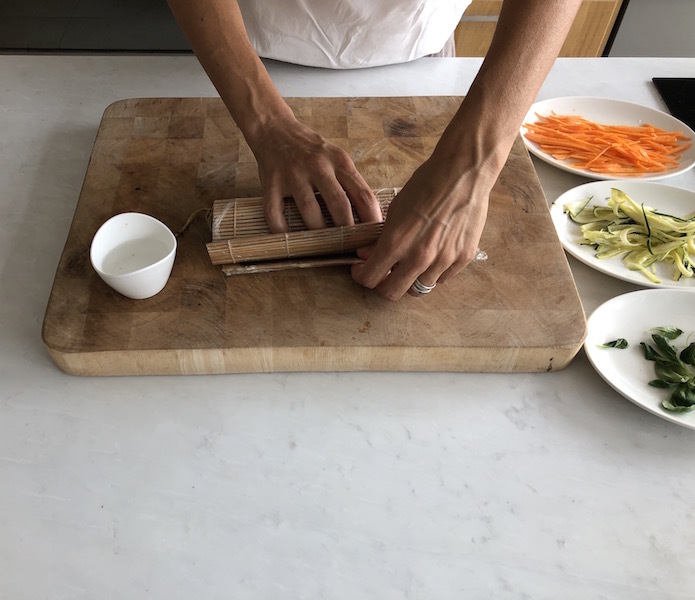 Cut each roll into two equal parts, then again into 4 parts to obtain 8 portions; use a very sharp knife and wipe it with wet kitchen paper so that you can cut nicely.